I need a spencer. Okay, I don't "need" a spencer, but as I develop at 1790s-early 1800s set of garments, a spencer, or a garment with some spencer-like features, would be a next likely project candidate. with the wrap-front dress again as morning dress, then retrimmed for afternoon or evening. A spencer has the advantage of using little fabric and being a small, portable project just right for doing a seam or two as I feel like it. Here at home we have so many important house projects going on that I while I'd like to be working on something as a change of pace in the evening from reading, and as a brain-freshener, the project needs to be one that requires little in the way of especial energy, and next to nothing in the way of expense. Herewith, a few ideas, all from the full span of Gallery of Fashion. Option 1: a blue wool spencer. Figure XLVI (on the right). ...Petticoat of worked muslin...Spencer of dark blue cloth, edged with scarlet. Ruff of white lace round the neck. Plain muslin handkerchief. York tan gloves. Option 2, a green cross-over front spencer. 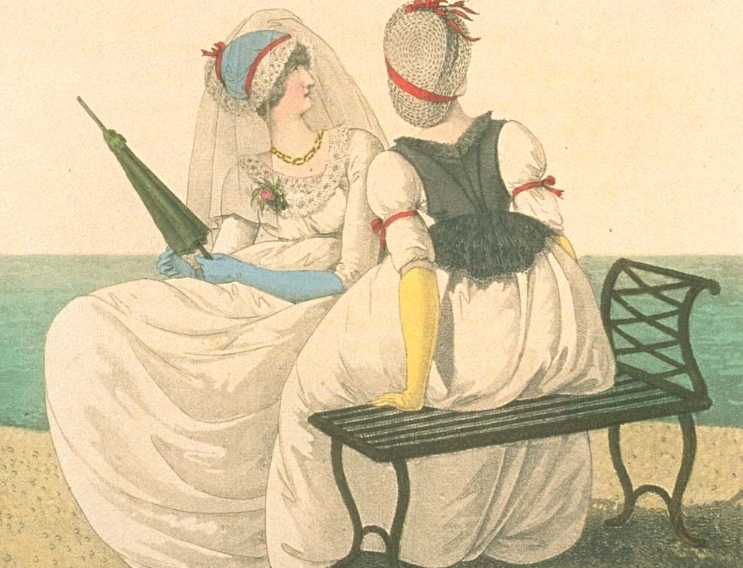 ...Petticoat of white muslin, with an embroidered border. 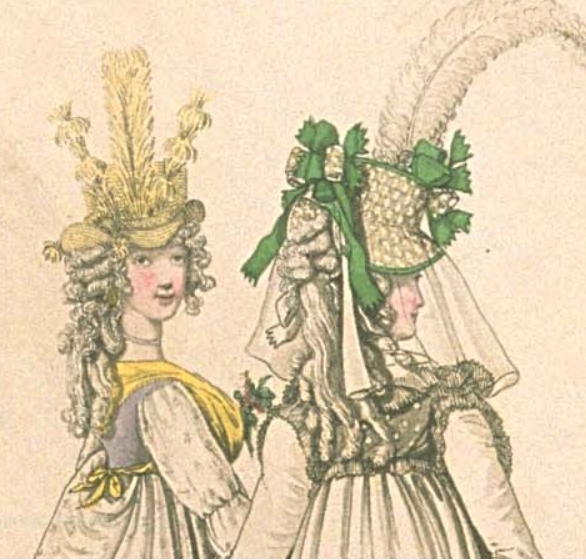 Spencer-corset of green satin, with plaitings in the front, and plaitings with a gold trimming at the wrists. Yellow sash, with gold tassels, tied on the left side. Triangular gold earrings. Four small gold chains round the neck. Yellow shoes, trimmed with blue fringe. Here's a handsome spencer, of a color that can be worn year round. 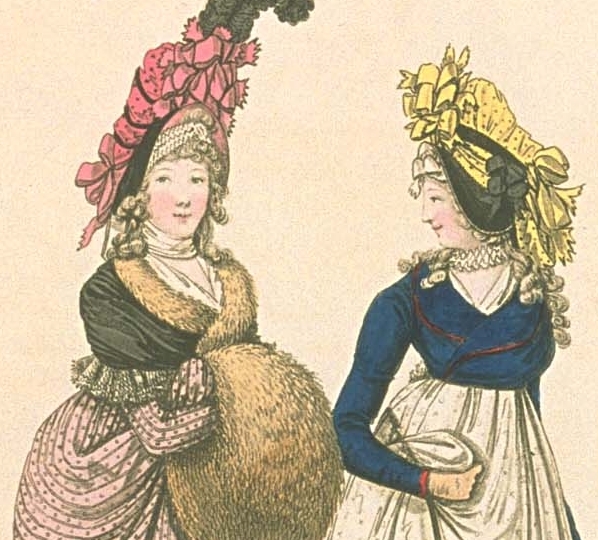 I cannot admire the "Minerva bonnet", but the "spencer-corset"! (Interesting terminology.) The effect is handsome and understated, and that Regency green just sings, doesn't it? To make it, it is nothing but the top from a wrap-front dress with some pleatings on it, and tight sleeves. The sash, a nice length of my silk, painted or dyed, with silk floss tassels. Still, with long sleeves, this one doesn't really work for very hot summertime wear -- which is when I tend to dress, anyhow, and it cannot convert to a habit style, for a more rugged look. Hmmm. Must think. Is this the one anyway, despite the limitations? Or does that wait, too? What about another option, the "body", a sleeveless bodice? Even less fabric is needed, and but a bare few seams, and it is easy to wear in the summer to give a blast of color to the ubiquitous white dress. Why yes, I think I can see that easily. I would need less than a yard of fabric, and gee, I have some lovely periwinkle silk, just waiting in the stash, left over from a shift dress I made to wear to a wedding some years ago. 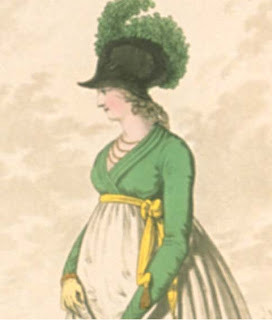 ...Round gown of embroidered muslin, flounced at the bottom. Short full sleeves, drawn in the middle of the arm. Body of lilac taffeta. Yellow handkerchief, crossed in the front, and tied behind. The yellow handkerchief adds yet more color. Let's borrow her friend's hat though, shall we? Her own reminds me of a corona of straw. To make it, the pattern from my cotton dress for the back, and a wrap front, which will look the best with the underlying dress. As for convertability, as you will see in the example below, the "body" can be worn for evening dress as well, when it is trimmed a little more. ...Muslin petticoat, trimmed at the bottom with blue satin in vandyke scallops; short full sleeves of muslin, trimmed with blonde. 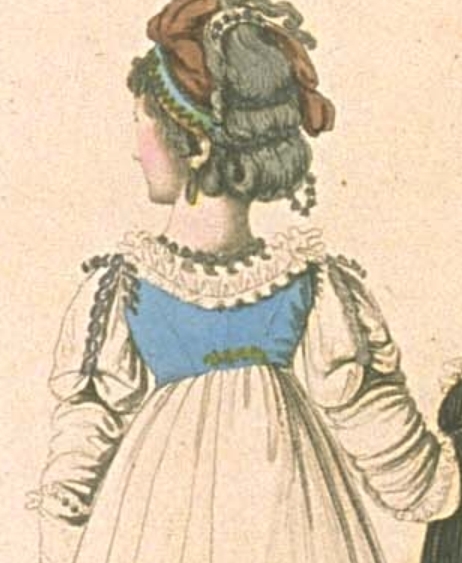 Body of blue satin, trimmed round the neck with a double plaiting of blonde, and on the back with a chain; epaulettes of the same, looped with a spring chain and tassels of gold. This one is funky. Perhaps originally the bodice and sleeves were sewn attached to one another, but it could be easily treated as a separate body, with lace tacked on. The full sleeves of my dress could be pulled up with braided braid and tassels, and the ends tacked with lace as well. The chain in back, more braided braid, set with small buttons at each end, and again, tacked on as needed. For right now, this tiny garment of four seams might just be the thing. Mmm, I see too that I could do plaitings to the front of the periwinkle body, then make removable sleeves that tack in, as was so often done, and voila, have a periwinkle spencer. 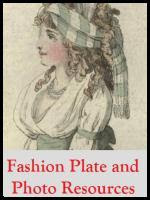 The ultimate in convertibility, for it would go from sleeveless undress to sleeveless evening wear to sleeved daywear. Wow. Really, how can you beat that? The next question, will that fabric eke out? Here is a handsome summertime option. Jackets never fully went away; in a few issues previous to the plate below, there is a Hungarian fur-trimmed jacket, for example. In this case, the jacket...a jacket because it has skirts -- or what we might call a peplum today -- is sleeveless. I like this one especially because it's in black gauze, and so it let's the dress show through, and is as light as light. Don't you enjoy the seaside view, as well? I think it's an effective picture. ...Round gown of white muslin, short full sleeves, tied in the middle with a coquelicot riband. Half jacket of black gauze, trimmed with broad black lace...yellow gloves. 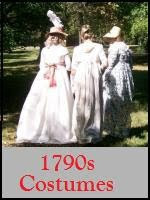 To make this one, I would use the pattern from the bodice from my cream robe, which has the same back. We cannot see the front, but I would do a wrap front, using the pattern from my little white dress. The peplum? I'd drape that to see what would work best. I already have some sheer black cotton, rescued from a cutter garment, a gift from a friend, and black lace, ditto. Because of the lace, the jacket could work as well for afternoon or evening as morning, especially if dressed up with jewelry. It is a fussier design, but sweet. Mmmm. What to do? Which would you choose? They're all so lovely! The green cross-over front spencer is adorable. Excellent choices...I still favour the blue one though. Maybe lightweight wool would make it also suitable for summer?! I have a wool spencer lined with cotton and it's comfy to wear in all seasons. Have you browsed the spencers at the MET?! There are so many beautiful pieces (and I have secretely picked two for upcoming projects) even for the late 18ths and early 19ths. Very inspiring! A curve ball! Silk body, with fabulous rouleau work. Like this pelisse that I saw in London and almost cried with pleasure! Good morning! Yes, it is SO good to be better. Secretly I love the blue one best, too, yet at 90 to 95 degrees on a typical summer day, wool will leave me panting. Still, it's tempting to do it anyhow, since it's so striking. 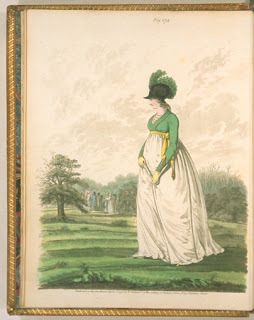 Had you seen the pelisse that Mrs. C. pointed out? Wonder if you'd do that one?? Wowwwww... 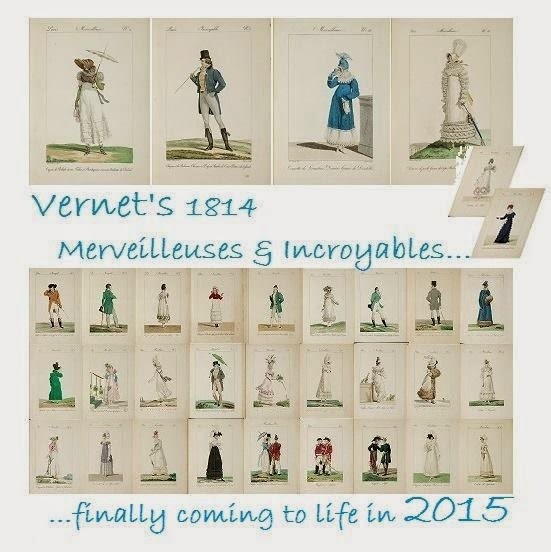 The pelisse is gorgeous, flat gorgeous, and would be a treat to wear. If I could stretch my periwinkle silk to go that far, but alas, I have less than two yards. I would do them ALL! I used to love things that worked for more than one purpose, when I just sewed for myself, but now that I costume 12 models at a time, lots of variants of the same garment are my best friend. Especially if they whip up quickly. I do have to say that the green spencer-corset is a bit of a favourite though. I'm such a sucker for green! I wonder if the name is using corset in the original sense: to mean a bodice. And I'm lucky living in Wellington: it often is 4 seasons in one day, so I never have to pack away winter-wear, as there is every chance of the weather dipping into the '40s in midsummer. So wool is wonderful! I like em! I'm a sucker for periwinkle, and considering your climate sleeveless makes a lot of sense. Whoa! Left-hand lady in 1794 fashion plate appears to be very pregnant with a porcupine, lol. She seems to have 4 arms as well. Yes, that spencer-corset term...wonder if it did mean bodice. There is another, related term, "corsage", used in American fashion magazines in the 19th century, if not before. I need to do some etymological digging, eh? I had no idea Wellington was so variable! You all have such, well, tropical plants that I was sure it was normally quite warm. Perhaps you are more like San Francisco in the U.S., where fog cools it off? [laughing]...it's a four-armed porcupine monster muff! Long, long ago I remember an Aunt, or some relation, wearing a stole -- really a tippet -- made of minks, complete with heads, legs, and claws, strung together and eating one anothers' tails. What morbid fascination I had for that awful creepy thing slithering around her neck. Oooouughhch. "Yellow handkerchief, crossed in the front, and tied behind." You know what...I do that with my 'modern' outfits to keep my neck warm and the scarf stay in place. Got this gorgeous dusty red silk like scarf that's long enough to do it. Now that's good fortune indeed. The color should be lovely. Ah-ha! I've just had a 'now I know why' moment. I've been trying my hand at making short stays...and in short they don't provide the support to erm...stay. But when I tied a scarf in a way described for the yellow scarf it gave the support and extra lift needed for a buster gal and emphasised the waist more.